Monero (XMR) is a secure, private and untraceable cryptocurrency which allows you to be your own bank. You have full control and responsibility for your funds; your accounts and transactions are kept private. Monero is a free open-source proof-of-work (PoW) cryptocurrency that runs on Windows, Mac, Linux, and FreeBSD. Launched in April of 2014 under the name BitMonero, derived from Bit (as in Bitcoin) and Monero (“coin” in Esperanto), the community opted to shorten the name to just Monero within days. Monero represents the first fork of the CryptoNote-based currency Bytecoin, with significantly different target block time, and emission speed.The Monero Core Team discovered numerous incidents of poor quality code that was cleaned up and improved as part of that first hard fork. On September 4 of that same year, an unusual and novel attack was executed against the Monero network which partitioned it into two distinct subsets – which refused to accept the legitimacy of the each other. This created a short window of opportunity during which the attacker undertook a sort of counterfeiting. The privacy of Monero transactions were subsequently strengthened with the introduction of ring signature algorithm (RingCT) via Gregory Maxwell’s Ring Confidential Transactions (started at block #1220516). RingCT creates an additional layer of confidentiality by not displaying the amounts implicated in a transaction to those outside it. By early February, over 95% of all non-Coinbase transactions used the optional RingCT feature for added security. As of the next hard fork in September 2017, it became required. How does Monero derive value? Fungibility is considered by many to be an extremely important aspect for the future of cryptocurrency. Because Bitcoin is pseudo-anonymous, various altcoin tokens are trying to profit from private zero-knowledge transactions. Monero is considered by the general cryptocurrency community as a truly fungible coin. Monero allows you to send and receive funds without publicly exposing the transactions on the blockchain thereby ensuring privacy. The Monero daemon uses CryptoNote technology which utilizes ring signatures to ‘cloak’ data. Monero claims to have improved upon the CryptoNote feature through an opaque blockchain system called viewkey; which makes the system optionally transparent during transactions thereby requiring a private view key. Monero is strictly powered by the CryptoNight PoW algorithm; a mining algorithm specifically designed for use in ordinary CPU’s so that it has the potential to be efficiently tasked to billions of existing devices. This feature allows transparent CPU mining on the user’s computer in stark contrast to the de facto centralization of mining farms and pools found on the Bitcoin network. Monero doesn’t have a hard coded maximum block size unlike Bitcoin, which has a 1 MB block size limit preventing scaling for mass adoption. Since Monero has no maximum block size limit, a block reward penalty mechanism is built into the protocol to disincentive excessive block sizes. “Monero does not have a hard block size limit. Instead, the block size can increase or decrease over time based on demand. It is capped at a certain growth rate to prevent outrageous growth,” elaborates their website. By default, Monero’s system promotes net neutrality on its blockchain. Miners cannot become censers where the transaction goes or what it contains are obfuscated. “You can buy Monero from an exchange or from an individual. Alternatively, you can try mining Monero to get coins from the block reward,” states the official website. Exchanges where you can buy Monero include: Shapeshift, Poloniex, Bittrex, Bitfinex, Bitsquare. You can also buy Monero with fiat currencies EUR, GBP, USD, CAD, CNY at MoneroDirect. Shapeshift is the easiest way to buy Monero and their website can help you complete a successful transaction. If you would like to buy Monero through Poloniex, Bittrex, or Bitsquare you’ll need to set up an account and deposit funds to get started. Each exchange has a different environment for acquiring Monero in that you must buy it by fulfilling other traders’ sell orders resulting in fluctuating prices. On November 30, 2016, Binfinex opened trading for XMR/BTC and XMR/USD pairings, making it the first exchange to support a fiat-XMR pair. On January 2, 2017, Kraken opened trading for XMR/BTC, XMR/USD, and XMR/EUR. Monero is stored on an account based on two distinct cryptographic keys: the spend key and view key . The spend key is the only key required to authorize the transfer of funds while the view key grants access only to view an account balance for the purpose of an audit. Both types of keys are 64 characters long. The easiest way to store your Monero is by using the online-wallet MyMonero, a web-based platform owned and operated by Riccardo Spangi, one of the Monero core team members. However, MyMonero’s servers can see (but not spend) your balance resulting in a slight loss of privacy. 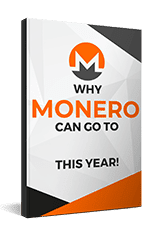 Running a full Monero node helps keep the network stable, secure and robust, while affording you the maximum privacy Monero has to offer with quick access to your funds. You will need a few gigabytes worth of disk space but not a large amount of processing power. There is also an official GUI wallet for Monero currently in the beta stage of development. The 3rd party Exodus wallet is said to add Monero support in the near future. For absolute security, store Monero on a paper wallet which effectively moves the funds offline into what is commonly referred to as “cold storage”. An offline wallet generator can be found here. In order to move your funds from the paper wallet and back online, you can either enter your mnemonic seed at MyMonero for a 1 Monero fee or input the seed into your Monero client. The best practice is to use a hardware wallet like the Ledger Nano S or the TREZOR. The unofficial TREZOR Monero firmware was released ,but was not maintained until made to be compatible when the network hard-forked to make RingCT transactions mandatory in September of 2017. The Chief Technology Officer (CTO) of Ledger has expressed support and willingness to assist in the development of Monero integration on the Ledger Nano S / Ledger Blue platform but it’s unclear if this effort is still underway. The Bitcoin algorithm is optimized for use on custom made mining chips, known as Application-specific integrated circuit chips (ASIC’s), not standard PCs and laptops. It’s futile for any ordinary computer to attempt to mine Bitcoin, and we now see a relative concentration of miners in countries with the cheapest electricity costs. In contrast, the Monero mining algorithm was specifically optimized for use on ordinary computers so people all over the world can leave mining software running on their home and work PC’s to earn Monero in exchange. This is even more profitable if someone else is paying the electricity bill (e.g. an employer or university). Monero’s blocks are produced on average every 2 minutes compared to Bitcoin’s every 10 minutes. Because blocks have a maximum size, if there is no room in your the current block your transaction will be delayed unless you increase the transaction fees that you pay to the network. Bitcoin blocks are frequently full resulting in increased transaction time and fees. Monero has been intentionally designed with an automatically adaptive block size limit so it can automatically handle future increases in transaction volume without issue. To support ‘ microtransactions ‘, Bitcoin and Monero will need to support systems like the ‘ Lightning network‘ to reduce the cost of small payments. Monero had the advantage before Bitcoin implemented a support technology called ‘ SegWit‘ to allow for micropayments in a scalable model on August 1st 2017. Time will tell how this plays out. I2P protects you from passive network monitoring so that your payments are untraceable and no one on the network can tell you are even using Monero. Bitcoin is more widely exchanged than altcoin like Monero. You can exchange BTC for Monero on the following exchanges: Poloniex, HitBTC, Bitfinex, Bittrex, Krken, Livecoin, BTER, BTC Alpha, Cryptopia, Tux Exchange and alcurEX. While there are a very large number of places to trade Monero, Bitcoin still comes ahead because that the markets above are all XMR/BTC (meaning that you need BTC to trade in the first place). Bitcoin has the highest priced cryptocurrency but Monero maintains a healthy $50-60 USD for the past 2 years. Bitcoin offers more stability but if you’re looking to speculate on more volatile changes, Monero may be more appropriate. Monero has an average block time of two minutes, confirming transactions in 1/5 of the time for a Bitcoin transaction. That significant difference proves to be one of the main advantages, other than security, that Monero has over Bitcoin. One of Monero’s main selling points is true anonymity hence why Monera bills itself as “Secure, Private, Untraceable”. Whereas Bitcoin provides pseudonimity (concealed vs protected identity), Monero provides actual anonymity by using ring signatures, which prevent your identity from being singled out. Monero is also untraceable because your address never actually appears on the Monero Blockchain, meaning that no one knows whose money it is or where it’s going. Keep in mind, however, that the sheer size of the Bitcoin network means BTC transactions are much less likely to be reversed that XMR transactions. It’s very clear that Bitcoin is the most accepted cryptocurrency on the market. We’ve yet to see altcoins like Monero being directly accepted on ecommerce websites, unlike Bitcoin. However, considering services that takes care of altcoin acceptance like shapeshift, this is hardly an issue. It is also worth noting that due to its privacy features, Monero is traded on darknet markets allowing for the argument that Monero is more accepted than other altcoin because it has a real-life use-case in marketplace consumption. It’s hard to find a currency that has more reputable developers than the Bitcoin core project although many opine that Monero comes in as a close second. For one, the project is entirely open-source, but having Fluffypony as one of the main project lead instills confidence in Monero users. The support for Bitcoin wallets is unparalleled in the crypto space but since Monero has the unique use-case of providing complete anonymity, you will find there are enough wallets to support your needs ranging from the full Monero client, to mobile, web and lightweight clients. Mymonero.com is a popular online wallet and it seems that Ledger is planning to integrate support for Monero for their hardware wallets. Monero’s liquidity cannot compare with Bitcoin’s liquidity since most markets require you to trade BTC for Monero in the first place. However, Monero’s market cap boasts a whopping 800+ million, with over 15+ million daily volume, making it one of the most traded altcoin.